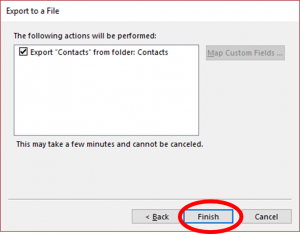 Note: The following instructions are from the 2016 version of Outlook, though Outlook 2013 will be very similar. If you have a different version of outlook, see Microsoft's Help Page for exporting contacts to a .csv file, then continue with step 7 of this tutorial. 1. Open Outlook. In the top left, click File. In the dropdown menu that appears, click Open & Export and then Import/Export. 2. 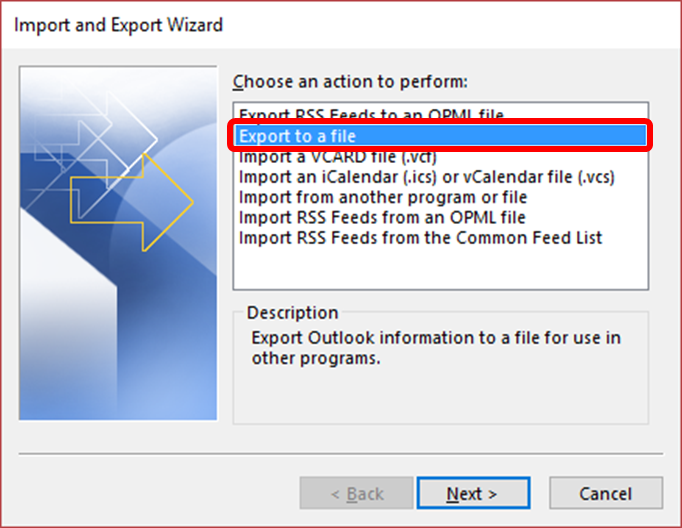 In the Import and Export Wizard select Export to a file, then select Next. 3. 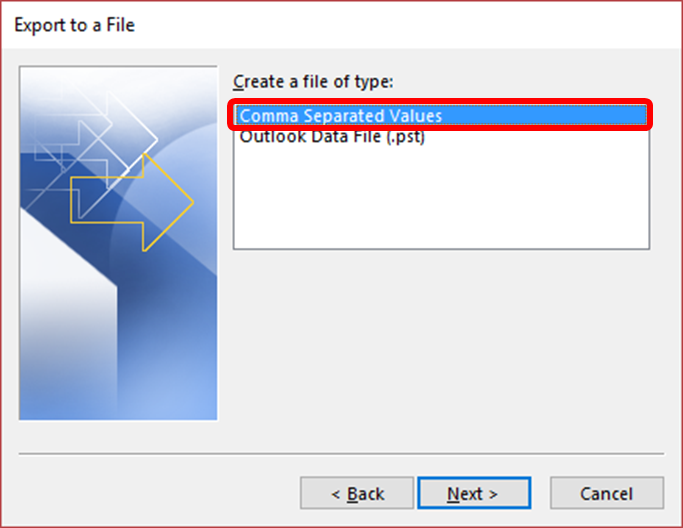 Choose Comma Separated Values and select Next. 4. 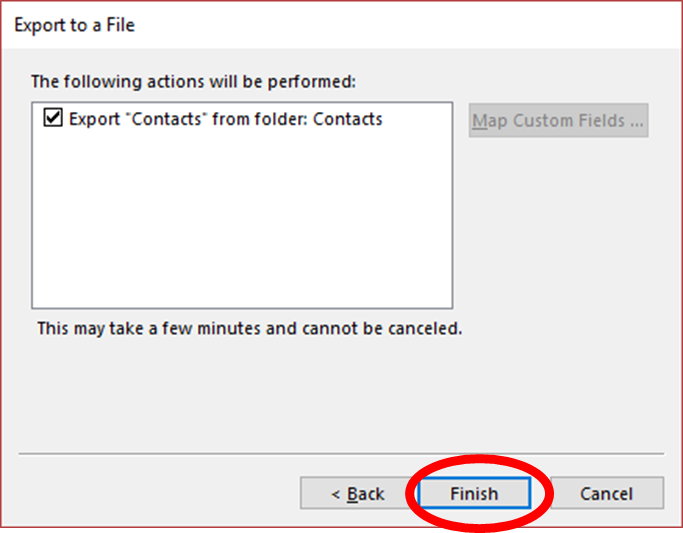 In the next Export to a File dialog box, find your Contacts folder and select it, then select Next. 5. In the next screen, click Browse and navigate to the location you want to save the .csv file to. You’ll need to find this later to import to FileFlex, so give it a memorable name and click Next. 6. In the next Export to a File dialog box, select Finish. 7. Open FileFlex. Select the menu in the Global Application Bar. 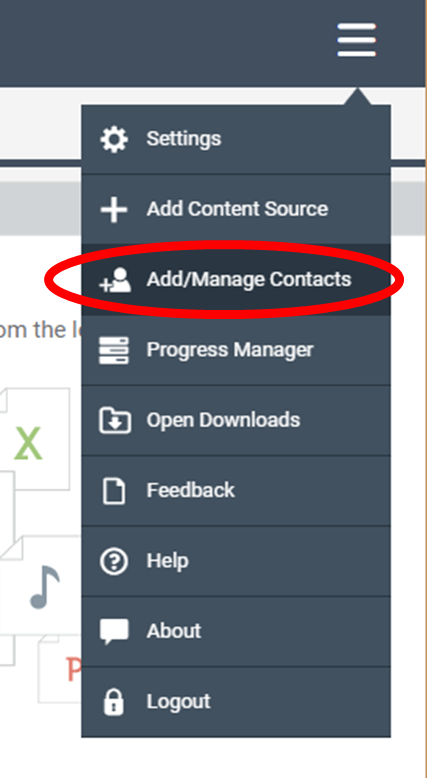 In the dropdown, select Add/Manage Contacts. 8. This opens the contact manager. In the contact manager, select Import Contacts from the drop-down menu on the right. 9. 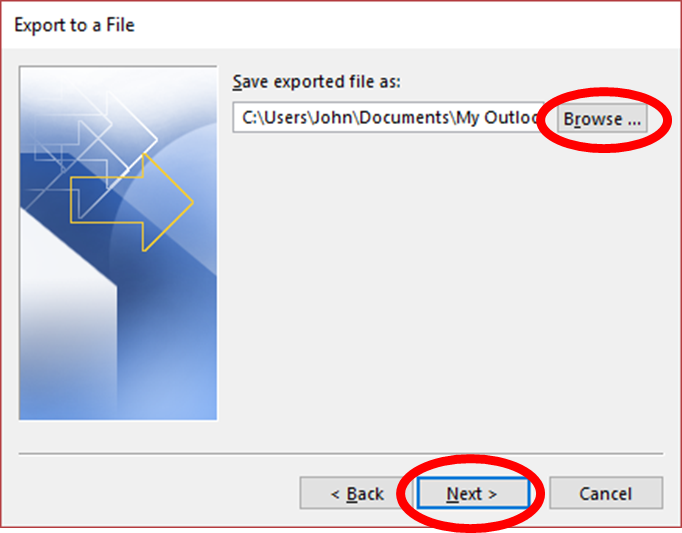 In the Import from dialog box, select Outlook. 10. In the Import from Outlook dialog box, select Choose File. 11. 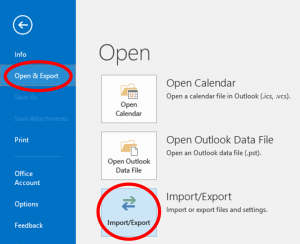 Navigate to the .csv file you exported from Outlook and select Open. 12. 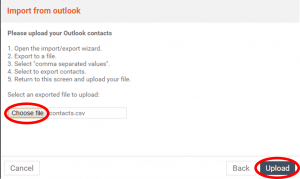 In the Import from Outlook dialog box, select Upload. 13. In the Contacts Imported dialog box, select Done. Open Gmail. Select the dropdown under Gmail and select Contacts. In the left column navigation column, select More then select Export. In pop-up dialog box, select GO TO OLD CONTACTS. In the top navigation bar, select the More dropdown then select Export. In the Export contacts dialog box, select the All Contacts radio button and select the Google CSV radio button. Then select Export. Open FileFlex. Select the menu in the Global Application Bar. 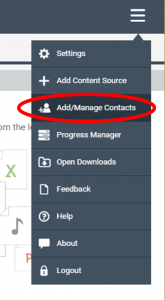 In the dropdown, select Add/Manage Contacts. This opens the contact manager. 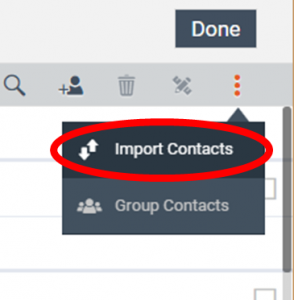 In the contact manager, select Import Contacts. In the Import from dialog box, select Delimited File. In the Import from csv dialog box, select Choose File. Navigate to the contacts file you exported from Gmail and select Open. The default download location is your Downloads folder. The default filename is google.csv. 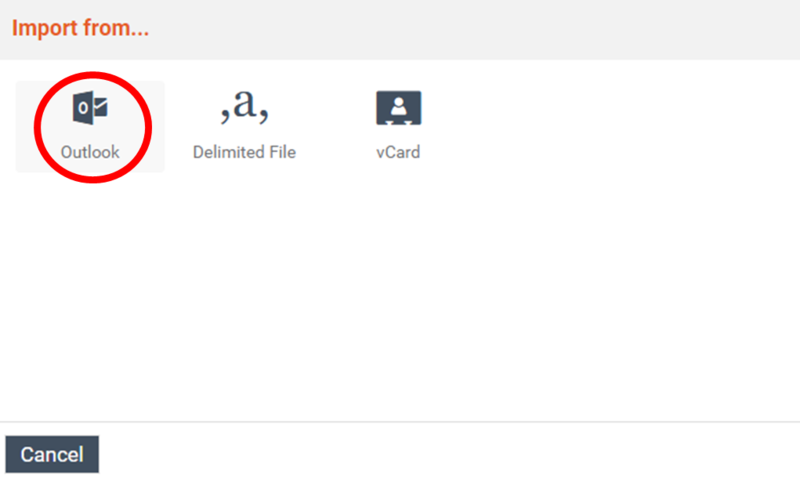 In the Import from csv dialog box, select Upload. In the Contacts Imported dialog box, select Done. In Contact Management, select Done. Open Yahoo Mail. Select Contact Manager icon located in the top left corner navigation bar. In the top task bar, select the Actions and in the dropdown select Export. A file will be exported to your downloads folder called yahoo_contacts.csv. Navigate to the contacts file you exported from Yahoo and select Open. The default download location is your Downloads folder. The default filename is yahoo_contacts.csv. Open FileFlex on your phone or tablet. Select the Menu located at the top right of the Global Application bar and in the dropdown select Add/Manage Contacts. In Contact Management select the Menu in the top right corner of the taskbar and in the dropdown select Import Contacts. In the Import from dialog box, select Device Contacts. Open Linked In. Select Connections in the top navigation bar and then select Keep in Touch in the dropdown. In Connections, select the Settings icon located at the top right corner. In Settings, select Export LinkedIn Connections located under Advanced Settings located in the right column. In the Export to dialog box, select Microsoft Outlook/CSV file in the dropdown. (This is the default selection). Enter the characters in the Security Verification captcha and select Continue. 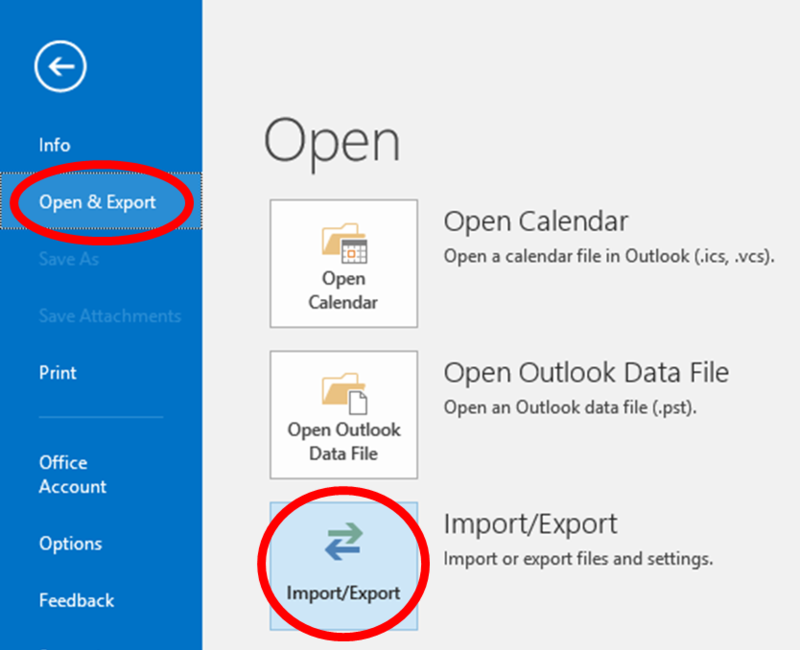 In the Import from dialog box, select Outlook. In the Import from Outlook dialog box, select Choose File. Navigate to the contacts file you exported from LinkedIn and select Open. 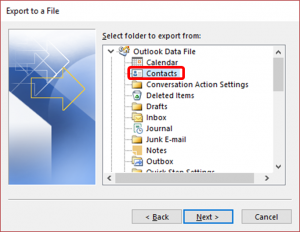 The default download location is your Downloads folder and the default filename is linkedin_connections_export_micosoft_outlook.csv. In the Import from Outlook dialog box, select Upload. Congratulations, you have imported your LinkedIn contacts. Select Done. Why can't I download a file shared with me? If the shared file is stored on a device that is not currently on and connected to the internet - a PC, for example - then you won't be able to download that file until the device is turned on. The best solution is to make sure that any files you share are stored somewhere that's always on and connected to the internet, such as a Network Attached Storage device (NAS) or a server. Alternatively, make sure you communicate with the person who is sharing the file with you so you can access it to download. Why is it taking so long to download a file that's been shared with me? If you encounter slow downloading, it is likely due to the upload speed of the sender, not the download speed of the recipient. Can I connect my NAS to FileFlex if it's not one of the supported types? FileFlex currently supports Netgear, Qnap, Synology, and Drobo devices. However, if you have an unsupported NAS you can still access it through FileFlex if you have another connected device on the same network, such as a server or a PC. First, select the server or PC in FileFlex, then click on "Network" in the right column. Next, select the NAS or other device you'd like to access. You may be prompted to enter the device credentials, and then you will have access to the files on that device. Note that if you are using a PC to network into your NAS, your PC will have to be on, not hibernating, and connected to the network in order to be able to access files on your NAS remotely. Is it possible for my clients to upload files to me through FileFlex? You need to be a full user of FileFlex in order to share files with others, though a free account will still let you view any content that's been shared with you. In order to share files with you, your client will either need to use the 30 day free trial version of FileFlex or purchase the full version. Does FileFlex sync my data and keep it on a Qnext server? No, FileFlex doesn't store or sync your files to any server anywhere. Your files are shared, accessed, and streamed from their source locations. If your files are stored on your PC, then you are accessing them from your PC. If they are on your NAS, you are accessing the NAS using FileFlex. The FileFlex server acts like a switchboard to connect you to your files. Your files are not synced, copied, or stored by FileFlex or any third parties. Is it possible for files to become lost or corrupt if there is a bug in FileFlex? No. Your files stay in their source locations, so any issues with FileFlex software will not affect your files. A file cannot be "accidentally" deleted. Can I upload photos and videos from my phone to my NAS with FileFlex? Yes, you can upload photos and videos from your mobile device to your NAS, or any other connected storage using FileFlex. If you'd like to upload your photos and videos to your NAS, you will first need to add your NAS to FileFlex as a content source. FileFlex currently supports NAS devices from QNAP, Netgear, and Synology. If you have a different NAS, you can access it through our Networking feature. After you have added your NAS to FileFlex, you can set FileFlex to automatically backup your photos and videos from your phone or tablet to your NAS through the Photo Sync feature.